You know who deserves a gorgeous bouquet of flowers right now? That’s right- you do! Sure, you could wait for some hunky catch to show up at the door with a a mess of roses or for that boss of yours to finally recognize what a diamond you are and drop off a vase of pretty stems to thank you for all your hard work, but why leave it up to someone else to decide what flowers you deserve? You know exactly what you want, what you need, and what you are worth. Mmhmm, you got it- stargazer lilies. 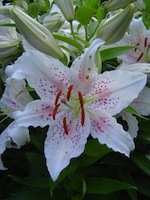 Stargazers are a special hybrid of Oriental lilies known for their fragrance and large blooms. First cultivated in 1974 by the California lily breeder, Leslie Woodriff, they have quickly become the “it” flower for the discerning woman who wants a flower that goes the distance. They can come in solid white or with petals that have white undersides and pink or magenta inside petals that are revealed as they bloom. The pollen produced by each flower can be a bit much, so use tissue to pluck off the stamens if you don’t want the reddish-orange pollen to stain the petals. Each flower can reach 6 to 8 inches in width when fully opened. Not that size matters, but sometimes, well..it does. Why wait for someone to show up with some dinky blossoms when you can wrap your had around a stem with blooms the size of a salad plate. Best of all, the 2-3 blooms on each stem open up slowly, so even after the first one is spent, the lower blooms gradually open giving you a week or more of fragrance and beauty. Stargazer lilies don’t look cheap, so don’t expect them to come cheaply. Each stem will cost about $2-5 each, but you only need one or two to make a statement. Besides, you’re worth it.